With the recent advancement in technology and demand for personalized care, the healthcare sector has been gradually gravitating towards Internet of Things(IoT) and Telemedicine. Telemedicine simply refers to the discipline of delivering health services such as assessments and consultation remotely via electronic systems. Telemedicine helps health practitioners to evaluate, diagnose and treat patients without having to make physical visits to the health centers. The discipline of telemedicine was developed in a bid to provide more efficient care at a lesser cost. The technology allows both patients and physicians to save time by providing them with an opportunity to handle minor and non-urgent issues remotely. While the technology is yet to grow into the mainstream, several states across the united states are passing regulations to facilitate telemedicine. In the recent past, there has been a significant buzz surrounding blockchain and healthcare. While some of the hype is exaggerated, blockchain retains tremendous potential to revolutionize telehealth and the healthcare sector in general. Due to blockchain’s ability to provide immutable, dis-intermediated, anonymous, and secure transaction, proponents have hailed it as the solution for wide-scale exchange and transfer of health information. Blockchain can further help in reducing operational friction by connecting the currently fragmented systems to generate holistic insight and improved care. Blockchain and telemedicine share a common goal of empowering the consumer through decentralization. The two models focus on providing patients with autonomy to decide services or process they are willing to participate in. These two technologies are also geared toward streamlining workflows for service providers. 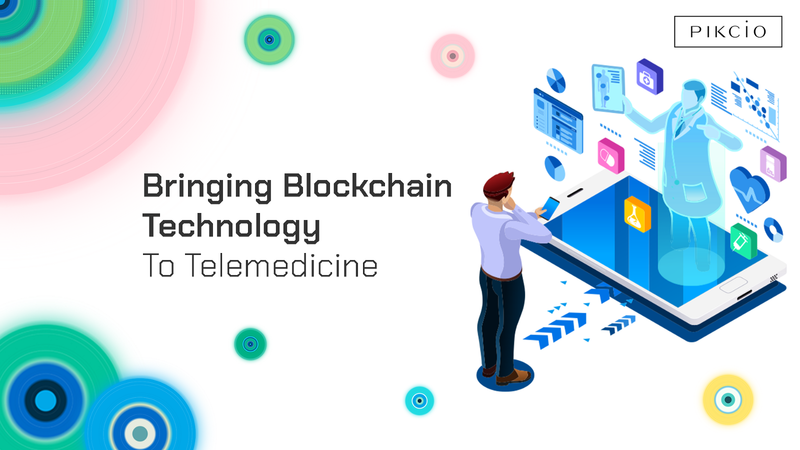 Developments towards the application of blockchain in Telemedicine are still ongoing. Researchers and regulators are yet to underscore the scope and value of blockchain but the signs so far are widely promising. Blockchain is a decentralized ledger that allows for enhanced scalability and expansion. When applied in telemedicine, blockchain will allow physicians to keep a wider patient history by compiling information from treatments, procedures, tests, and lab results. Blockchains can help in deploying medical IoT applications as decentralized applications on the network. With a plethora of IoT devices available today, providers are able to access diverse conditions and attain a holistic view of a patients condition. With more comprehensive data diagnosis, prediction and prevention of illnesses is strongly improved. One of the primary criticism towards telemedicine has been centered around privacy constraints. A significant number of patients and health system users are growing concerned about the privacy and security of their data. With several high-profile leaks and hacks on medical records, users have grown to mistrust these services and opt for traditional systems. Overall, this mistrust has hampered the usage and uptake of telemedicine applications. With the entry of blockchain which is renown for being immutable and anonymous, patients can now rest easy. The application of blockchain in telemedicine will help in increasing consumer confidence and trust in the systems. Besides security, Blockchain offers unrivaled accuracy and transparency. With the need for validation of each transaction, it is virtually impossible for inaccurate claims to be allowed into the system. Cases of insurance fraud and false patient claims are significantly reduced. The inception of smart contracts and decentralized nature of the blockchain platform also helps in increasing the network’s transparency. Earlier this year London based Health IT company, Medicalchain, announced the launch of a Telemedicine platform called Myclinic.com. The blockchain powered platform allows patients to access medical consultation services online. Patients pay for the services using MTN tokens which are the native cryptocurrencies for the platform. The platform helps to connect patients and physicians seamlessly and conveniently through a secure network. Patients are allowed to select their preferred physicians from a pool of experienced and skilled professionals listed on the platform. A similar application to Myclinic.com is Korean based MDsquare. The application which is available in Android and iOS is aimed at providing convenient and affordable services for patients around the world. Given the sky-rocketing price of medical services in the developed world, MDsquare aims at providing a cheaper alternative through its application. The application utilizes smart contracts that are used to reward all the participants in the value chain. On our side, Pikcio has decided to partner with P2Link in order to step into the telemedicine ecosystem. As we share the same value that strives to put the user in the center, P2Link has designed an efficient system to follow and to monitor patients with chronic illnesses, always keeping the patient at the center of its efforts. Moreover P2Link is highly focused towards IoT, depending on the stage of the disease, patients’ homes are equipped with tailored connected medical devices, Using the Internet of Medical Things (IoMT), significant physiological parameters are collected on a regular basis and transmitted to P2Link’s predictive engine through our secured blockchain solution. With P2Link we will try to answer the growing needs of the industry and focus our shift on personal insurance related products as we will see in our next article. Since time immemorial, the healthcare sector has been faced with a dearth in resources and personnel. These challenges have in turn resulted in rising medical costs and poor clinical outcomes. While still in their nascent stages telemedicine and Blockchain have demonstrated significant potential for the industry. Whether this will be the ultimate solutions only time will tell. What is sure is that numerous companies and individuals are already warming up to these technologies. Doctor in Medical Psychiatry and computer science passionate, I evolve in the blockchain and cryptocurrency space since 2011.